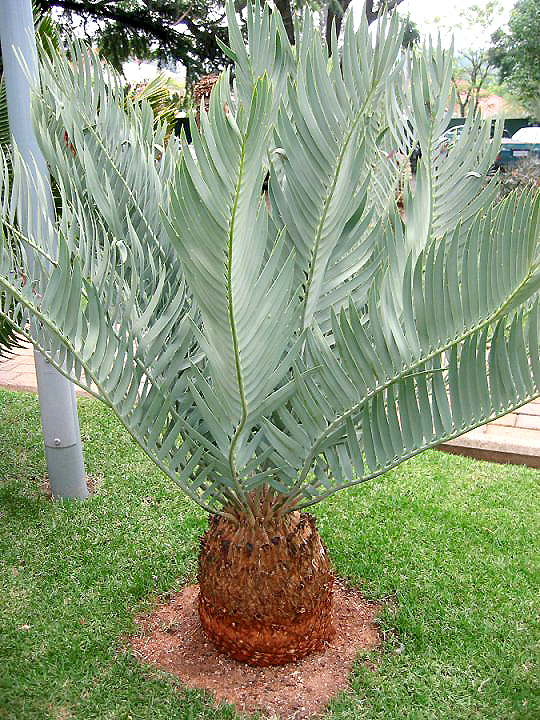 Encephalartos eugene maraisii is the first described species among the blue-leaved Transvaal cycads, discovered by the writer and naturalist, Eugene Marais. It is native to South African mountains in Waterberg, Pietersburg, Witbank, and Middelburg. Please click here to see a larger Encephalartos eugene maraisii image. Encephalartos eugene maraisii is also known as the Waterberg Cycad, closely related to several other species ( Encephalartos middelburgensis, Encephalartos dyerianus, Encephalartos dolomiticus and Encephalartos hirsutus), distinguished by its straight leaves which recurve at their ends, spineless median leaflets, clear petiole, and green cones with a fine brown tomentum (fuzz). Encephalartos eugene maraisii forms solitary or clumping trunks, up to 8 ft. tall, 1-1 ½ ft in diameter. Its leaves silver-blue are 3-5 feet long, leaflets keeled, lance-shaped, overlapping downwards, without lobes, or teeth, median leaflets 6-8 inches long, ½ - ¾ inch wide.